Transport category aircraft typically carry hundreds of passengers and fly thousands of miles each trip. Therefore, large aircraft require extremely reliable power distribution systems that are computer controlled. These aircraft have multiple power sources (AC generators) and a variety of distribution busses. A typical airliner contains two or more main AC generators driven by the aircraft turbine engines, as well as more than one backup AC generator. DC systems are also employed on large aircraft and the ship’s battery is used to supply emergency power in case of a multiple failures. The AC generator (sometimes called an alternator) produces three-phase 115-volt AC at 400 Hz. AC generators. Since most modern transport category aircraft are designed with two engines, there are two main AC generators. The APU also drives an AC generator. This unit is available during flight if one of the main generators fails. The main and auxiliary generators are typically similar in output capacity and supply a maximum of 110 kilovolt amps (KVA). A fourth generator, driven by an emergency ram air turbine, is also available in the event the two main generators and one auxiliary generator fail. The emergency generator is typically smaller and produces less power. With four AC generators available on modern aircraft, it is highly unlikely that a complete power failure occurs. However, if all AC generators are lost, the aircraft battery will continue to supply DC electrical power to operate vital systems. Transport category aircraft use large amounts of electrical power for a variety of systems. Passenger comfort requires power for lighting, audio visual systems, and galley power for food warmers and beverage coolers. A variety of electrical systems are required to fly the aircraft, such as flight control systems, electronic engine controls, communication, and navigation systems. The output capacity of one engine-driven AC generator can typically power all necessary electrical systems. A second engine-driven generator is operated during flight to share the electrical loads and provide redundancy. The complexity of multiple generators and a variety of distribution busses requires several control units to maintain a constant supply of safe electrical power. The AC electrical system must maintain a constant output of 115 to 120 volts at a frequency of 400 Hz (±10 percent). The system must ensure power limits are not exceeded. AC generators are connected to the appropriate distribution busses at the appropriate time, and generators are in phase when needed. There is also the need to monitor and control any external power supplied to the aircraft, as well as control of all DC electrical power. Two electronic line replaceable units are used to control the electrical power on a typical large aircraft. The generator control unit (GCU) is used for control of AC generator functions, such as voltage regulation and frequency control. The bus power control unit (BPCU) is used to control the distribution of electrical power between the various distribution busses on the aircraft. The GCU and BPCU work together to control electrical power, detect faults, take corrective actions when needed, and report any defect to the pilots and the aircraft’s central maintenance system. There is typically one GCU for each AC generator and at least one BPCU to control bus connections. These LRUs are located in the aircraft’s electronics equipment bay and are designed for easy replacement. When the pilot calls for generator power by activating the generator control switch on the flight deck, the GCU monitors the system to ensure correct operation. If all systems are operating within limits, the GCU energizes the appropriate generator circuits and provides voltage regulation for the system. The GCU also monitors AC output to ensure a constant 400-Hz frequency. If the generator output is within limits, the GCU then connects the electrical power to the main generator bus through an electrical contactor (solenoid). These contactors are often called generator breakers (GB) since they break (open) or make (close) the main generator circuit. 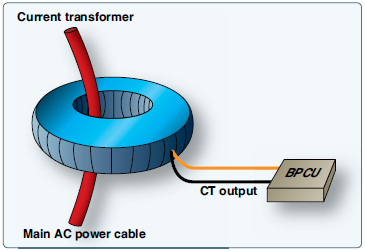 A CT is an inductive unit that surrounds the main power cables of the electrical distribution system. As AC power flows through the main cables, the CT receives an induced voltage. The amount of CT voltage is directly related to the current flowing through the cable. The CT connects to the BPCU, which allows accurate current monitoring of the system. A typical aircraft employs several CTs throughout the electrical system. The BPCU is a dedicated computer that controls the electrical connections between the various distribution busses found on the aircraft. The BPCU uses contactors (solenoids) called bus tie breakers (BTB) for connection of various circuits. These BTBs open/close the connections between the busses as needed for system operation as called for by the pilots and the BPCU. This sounds like a simple task, yet to ensure proper operation under a variety of conditions, the bus system becomes very complex. There are three common types of distribution bus systems found on transport category aircraft: split bus, parallel bus, and split parallel. Modern twin-engine aircraft, such as the Boeing 737, 757, 777, Airbus A-300, A-320, and A-310, employ a split-bus power distribution system. During normal conditions, each engine-driven AC generator powers only one main AC bus. The busses are kept split from each other, and two generators can never power the same bus simultaneously. This is very important since the generator output current is not phase regulated. (If two out-of-phase generators were connected to the same bus, damage to the system would occur.) The split-bus system does allow both engine-driven generators to power any given bus, but not at the same time. Generators must remain isolated from each other to avoid damage. The GCUs and BPCU ensures proper generator operation and power distribution. On all modern split bus systems, the APU can be started and operated during flight. This allows the APU generator to provide back-up power in the event of a main generator failure. A fourth emergency generator powered by the ram air turbine is also available if the other generators fail. The four AC generators are shown at the bottom of Figure 2. These generators are connected to their respective busses through the generator breakers. 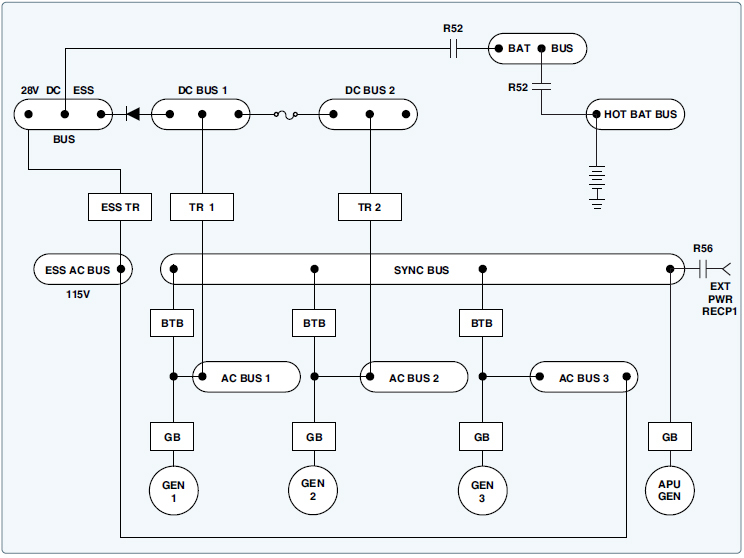 For example, generator 1 sends current through GB1 to AC bus 1. 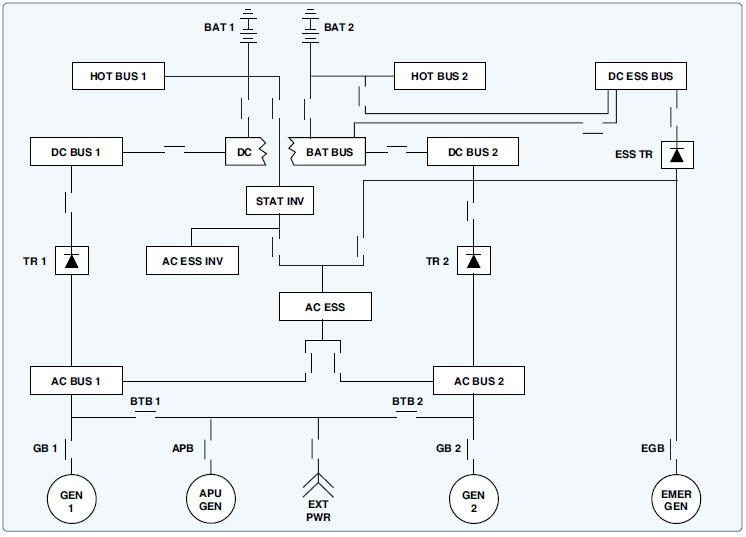 AC bus 1 feeds a variety of primary electrical loads, and also feeds sub-busses that in turn power additional loads. The GB 1 is opened by the GCU to disconnect the failed generator. The BPCU closes BTB 1 and BTB 2. This supplies AC power to AC bus 1 from generator 2. The pilots start the APU and connect the APU generator. 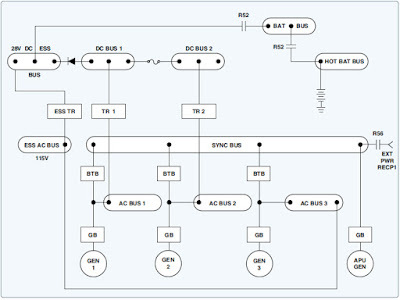 At that time, the BPCU and GCUs move the appropriate BTBs to correctly configure the system so the APU powers bus 1 and generator 2 powers bus 2. Once again, two AC generators operate independently to power AC bus 1 and 2. If all generators fail, AC is also available through the static inverter (center of Figure 2). The inverter is powered from the hot battery bus and used for essential AC loads if all AC generators fail. Of course, the GCUs and BPCU take the appropriate actions to disconnect defective units and continue to feed essential AC loads using inverter power. To produce DC power, AC bus 1 sends current to its transformer rectifier (TR), TR 1 (center left of Figure 2). The TR unit is used to change AC to DC. The TR contains a transformer to step down the voltage from 115-volt AC to 26-volt AC and a rectifier to change the 26-volt AC to 26- volt DC. The output of the TR is therefore compatible with the aircraft battery at 26-volt DC. Since DC power is not phase sensitive, the DC busses are connected during normal operation. In the event of a bus problem, the BPCU may isolate one or more DC busses to ensure correct distribution of DC power. This aircraft contains two batteries that are used to supply emergency DC power. Multiengine aircraft, such as the Boeing 727, MD-11, and the early Boeing 747, employ a parallel power distribution system. During normal flight conditions, all engine-driven generators connect together and power the AC loads. In this configuration, the generators are operated in parallel; hence the name parallel power distribution system. In a parallel system, all generator output current must be phase regulated. Before generators are connected to the same bus, their output frequency must be adjusted to ensure the AC output reaches the positive and negative peaks simultaneously. During the flight, generators must maintain this in-phase condition for proper operation. One advantage of parallel systems is that in the event of a generator failure, the busses are already connected and the defective generator need only be isolated from the system. A paralleling bus, or synchronizing bus, is used to connect the generators during flight. The synchronizing bus is often referred to as the sync bus. Most of these systems are less automated and require that flight crew monitor systems and manually control bus contactors. BTBs are operated by the flight crew through the electrical control panel and used to connect all necessary busses. GBs are used to connect and disconnect the generators. Figure 3 shows a simplified parallel power distribution system. This aircraft employs three main-engine driven generators and one APU generator. The APU (bottom right) is not operational in flight and cannot provide backup power. The APU generator is for ground operations only. 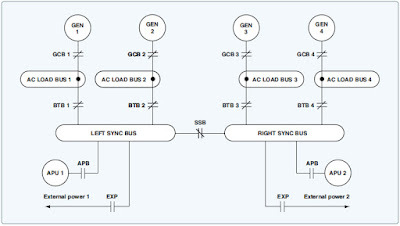 The three main generators (bottom of Figure 3) are connected to their respective AC bus through GBs one, two, and three. 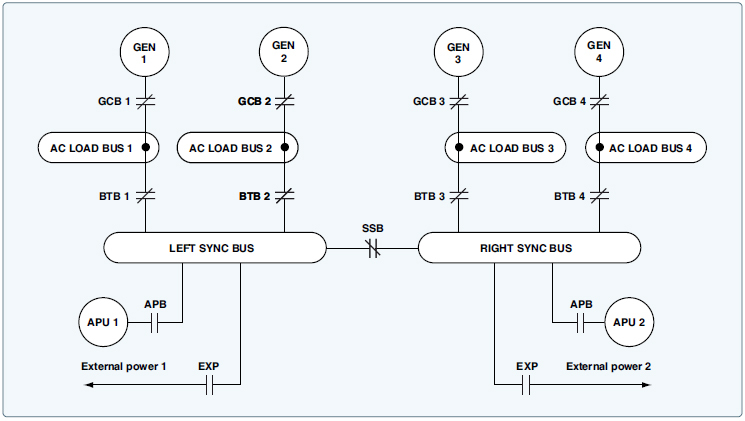 The AC busses are connected to the sync bus through three BTBs. In this manner, all three generators share the entire AC electrical loads. Keep in mind, all generators connected to the sync bus must be in phase. If a generator fails, the flight crew would simply isolate the defective generator and the flight would continue without interruption. The number one and two DC busses (Figure 3 top left) are used to feed the DC electrical loads of the aircraft. DC bus 1 receives power form AC bus 1 though TR1. DC bus 2 is fed in a similar manner from AC bus 2. The DC busses also connect to the battery bus and eventually to the battery. The essential DC bus (top left) can be fed from DC bus 1 or the essential TR. A diode prevents the essential DC bus from powering DC bus 1. The essential DC bus receives power from the essential TR, which receives power from the essential AC bus. 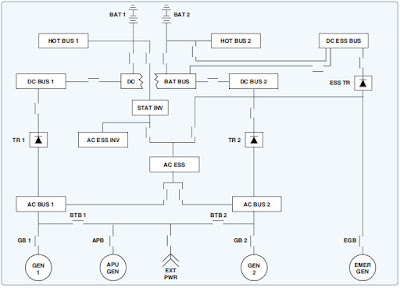 This provides an extra layer of redundancy since the essential AC bus can be isolated and fed from any main generator. Figure 3 shows generator 3 powering the essential AC bus. A split-parallel bus basically employs the best of both splitbus and the parallel-bus systems. The split-parallel system is found on the Boeing 747-400 and contains four generators driven by the main engines and two APU-driven generators. The system can operate with all generators in parallel, or the generators can be operated independently as in a splitbus system. During a normal flight, all four engine-driven generators are operated in parallel. The system is operated in split-bus mode only under certain failure conditions or when using external power. The Boeing 747-400 splitparallel system is computer controlled using four GCU and two BPCU. There is one GCU controlling each generator; BPCU 1 controls the left side bus power distribution, and BPCU 2 controls the right side bus power. The GCUs and BPCUs operate similarly to those previously discussed under the split-bus system. Figure 4 shows a simplified split-parallel power distribution system. The main generators (top of Figure 4) are driven by the main turbine engines. Each generator is connected to its load bus through a generator control breaker (GCB). The generator control unit closes the GCB when the pilot calls for generator power and all systems are operating normally. Each load bus is connected to various electrical systems and additional sub-busses. The BTB are controlled by the BPCU and connect each load bus to the left and right sync bus. A split systems breaker (SSB) is used to connect the left and right sync busses and is closed during a normal flight. With the SSB, GCBs, and BTBs, in the closed position the generators operate in parallel. When operating in parallel, all generators must be in phase. If the aircraft electrical system experiences a malfunction, the control units make the appropriate adjustments to ensure all necessary loads receive electrical power. For example, if generator 1 fails, GCU 1 detects the fault and command GCB 1 to open. With GCB 1 open, load bus 1 now feeds from the sync bus and the three operating generators. In another example, if load bus 4 should short to ground, BPCU 4 opens the GCB 4 and BTB 4. This isolates the shorted bus (load bus 4). All loads on the shorted bus are no longer powered, and generator 4 is no longer available. However, with three remaining generators operational, the flight continues safely. As do all large aircraft, the Boeing 747-400 contains a DC power distribution system. The DC system is used for battery and emergency operations. The DC system is similar to those previously discussed, powered by TR units. The TRs are connected to the AC busses and convert AC into 26-volt DC. The DC power systems are the final backups in the event of a catastrophic electrical failure. The systems most critical to fly the aircraft can typically receive power from the battery. This aircraft also contains two static inverters to provide emergency AC power when needed.